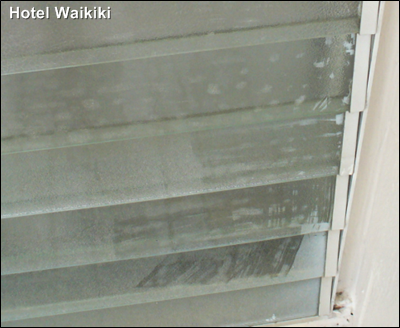 HOTEL WAIKIKI: The Painters Were Back to Clean Off the Overspray .... Can't You Just Tell? The Painters Were Back to Clean Off the Overspray .... Can't You Just Tell? Ron, that's disgusting!!! I hope your association gets them back RIGHT AWAY! Sheesh! That's quality work right there. Ann- and that's only the fraction of the oversprayed area on the lanai. The painter was cleaning it off with a razor blade, the lolo. Brad- well, this is the painter's opportunity to redeem themselves. Act II.